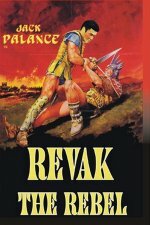 Revak is an Iberian prince from Penda, a small island where the Carthagian fleet ransacked and enslaved the surviving native men, including him. After an eventful passage aboard a galley, Revak becomes an elephant driver in Carthage city, and could become the favorite of mighty women, but has only one thirst: bloody revenge, at all cost, so the barbarian makes common cause with the attacking Romans, Carthage's historical enemy and rival for Mediterranean hegemony, scorning love. Originally working title was The Barbarians.